LRP1 mediates Aβ clearance in HBVSMCs. A, HBVSMCs were transfected with control or LRP1-siRNA and used for analysis 48 h after transfection. 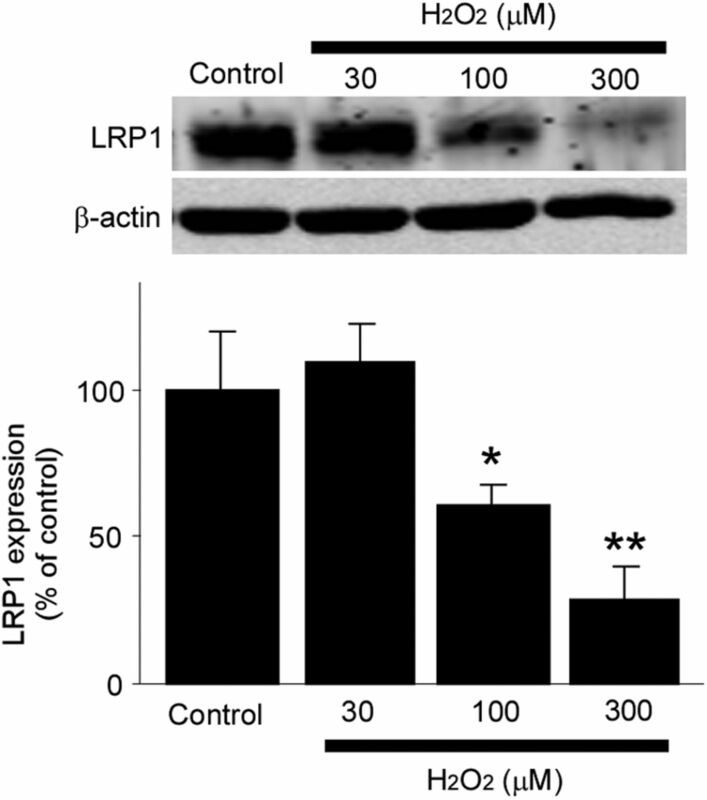 Western blotting showed that LRP1 expression was suppressed by LRP1-siRNA. B, HBVSMCs were incubated with or without γ-secretase inhibitor DAPT (10 μm) for 24 h, and the levels of full-length APP (FL-APP) and C-terminal fragments of APP (CTFs) were analyzed by Western blot. C, HBVSMCs were incubated for 4 d in the absence or presence of DAPT (10 μm), and the concentrations of Aβ40 in the media were analyzed by ELISA. 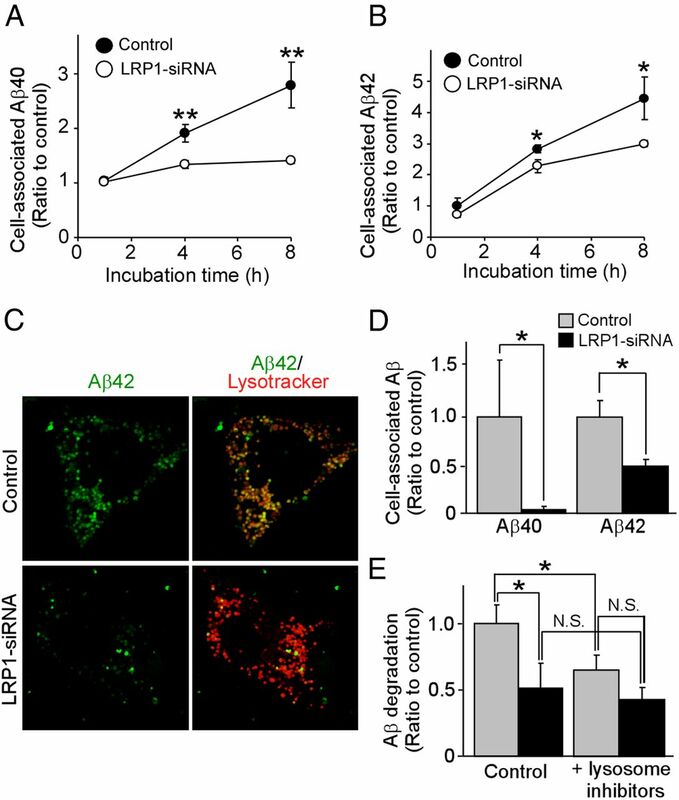 D, Control and LRP1-suppressed HBVSMCs were incubated for 4 d, and the concentrations of endogenous Aβ40 and Aβ42 in the media were quantified by ELISA. E, To examine whether LRP1 knockdown in HBVSMCs affects APP processing, CTFs were analyzed by Western blot and quantified. Data are plotted as mean ± SD (n = 3). **p < 0.01. N.S., Not significant. 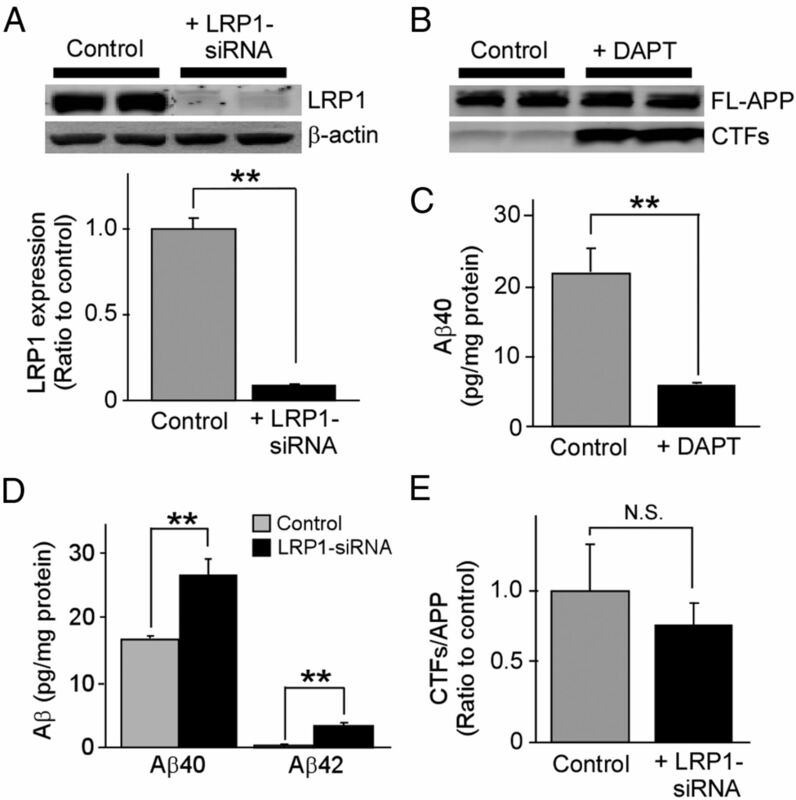 LRP1 mediates Aβ uptake and cellular clearance in HBVSMCs. A, B, The levels of cell-internalized Aβ40 (A) and Aβ42 (B) were analyzed by FACS in control and LRP1-suppressed HBVSMCs after incubation with FAM-labeled Aβ (500 nm) for 1, 4, and 8 h. C, Subcellular localization of internalized FAM-Aβ42 and its colocalization with lysosomal marker were observed by confocal microscopy in control and LRP1-suppressed HBVSMCs. D, Control and LRP1-suppressed HBVSMCs were incubated with unlabeled Aβ40 or Aβ42 (10 nm each) for 4 h, and cell-associated Aβ was quantified by ELISA. E, Control and LRP1-suppressed HBVSMCs were incubated with 1 μm Aβ40 (1 μm) for 1 h followed by additional incubation for 4 h in the presence or absence of lysosomal inhibitors (pepstatin, 1 μm; leupeptin, 50 μm; E-64d, 15 μm) without Aβ. Disappearance of cell-associated Aβ detected by ELISA was defined as degraded Aβ. Data are plotted as mean ± SD (n = 3). *p < 0.05; **p < 0.01. N.S., Not significant. LRP1 deletion in vascular smooth muscle cells in mouse brains leads to increased endogenous Aβ levels. 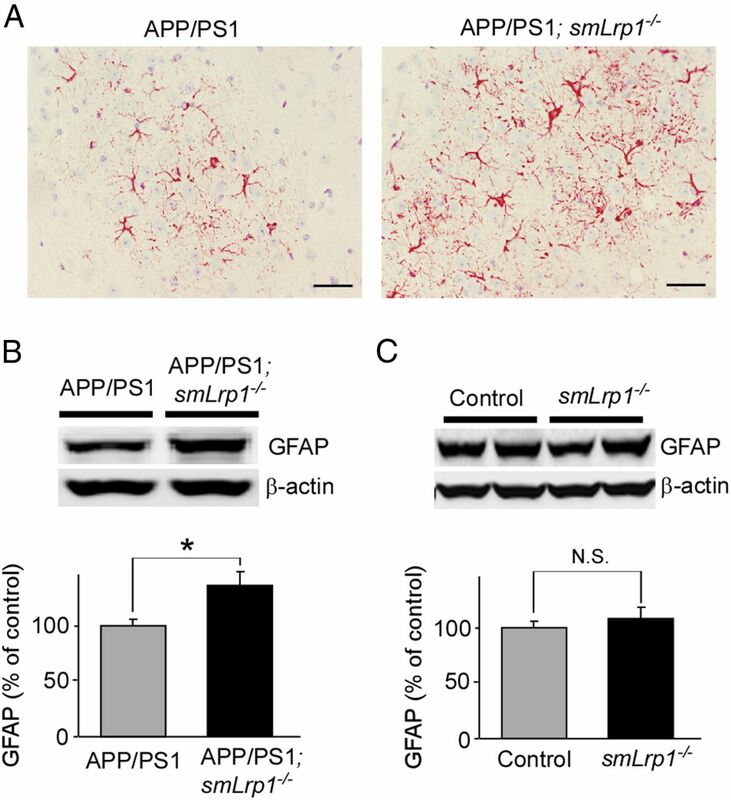 A, Leptomeningeal arteries isolated from control and smLrp1−/− mice were stained with LRP1 antibody and phalloidin (F-actin marker). Scale bar, 50 μm. B, LRP1 expression in isolated vessels and cortex from control and smLrp1−/− mice (4–5 months of age) detected by Western blot. C, Mouse endogenous Aβ40 and Aβ42 levels in the brains of control and smLrp1−/− mice analyzed by ELISA. Data are plotted as mean ± SEM (n = 6). *p < 0.05. 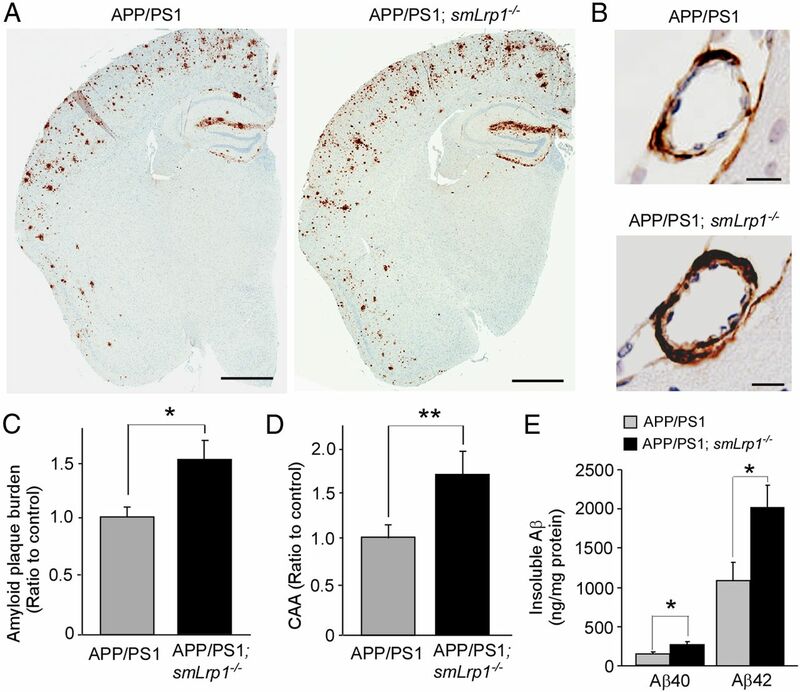 LRP1 deletion in vascular smooth muscle cells in APP/PS1 amyloid model mice exacerbates Aβ deposition as amyloid plaques and CAA. A, Aβ depositions in brain sections from control APP/PS1 and APP/PS1; smLrp1−/− mice (13–14 months of age) were immunostained with a pan-Aβ antibody. Scale bar, 1 mm. B, Immunostaining of Aβ deposition along leptomeningeal arteries as CAA in control APP/PS1 and APP/PS1; smLrp1−/− mice. Scale bar, 20 μm. C, D, Amyloid plaque burdens in cortex (C) and CAA formation in leptomeningeal arteries (D) were quantified after scanning Aβ immunostaining by the Positive Pixel Count program (Aperio Technologies). E, The concentrations of insoluble Aβ40 and Aβ42 levels in the cortex from control APP/PS1 and APP/PS1; smLrp1−/− mice analyzed by ELISA at 13–14 months of age. Data are plotted as mean ± SEM (n = 5). *p < 0.05; **p < 0.01. 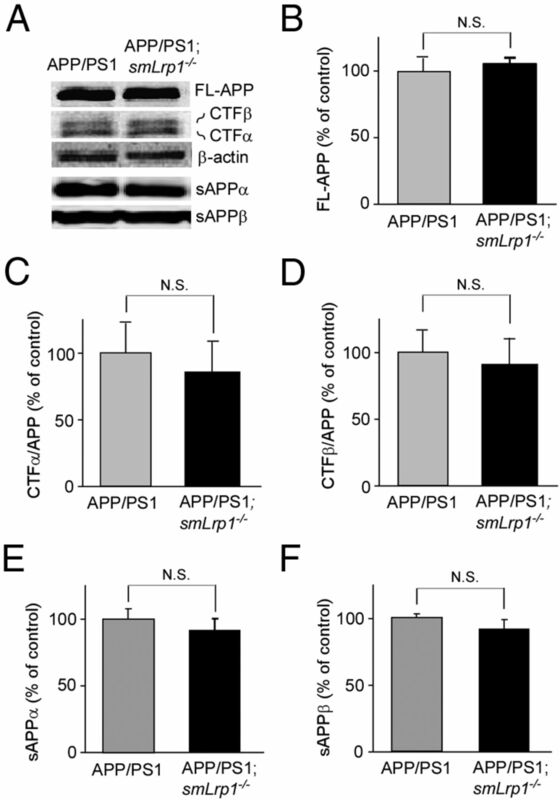 LRP1 deletion in vascular smooth muscle cells does not affect APP processing in APP/PS1 mice. APP and its processing products in both APP/PS1 and APP/PS1; smLrp1−/− mice at the age of 13–14 months were analyzed by Western blot (A). There were no significant differences in the levels of full-length APP (B), CTFα (C), CTFβ (D), sAPPα (E), and sAPPβ (F) between the two groups of mice. Data are plotted as mean ± SEM (n = 5). N.S., Not significant. LRP1 deletion in vascular smooth muscle cells does not affect the expression levels of major Aβ-degrading enzymes. The mRNA levels of neprilysin (A), IDE (B), MMP2 (C), and MMP9 (D) in the cortex from control and smLrp1−/− mice were quantified by RT-PCR at the age of 12 months. Data are plotted as mean ± SEM (n = 6). N.S., Not significant. 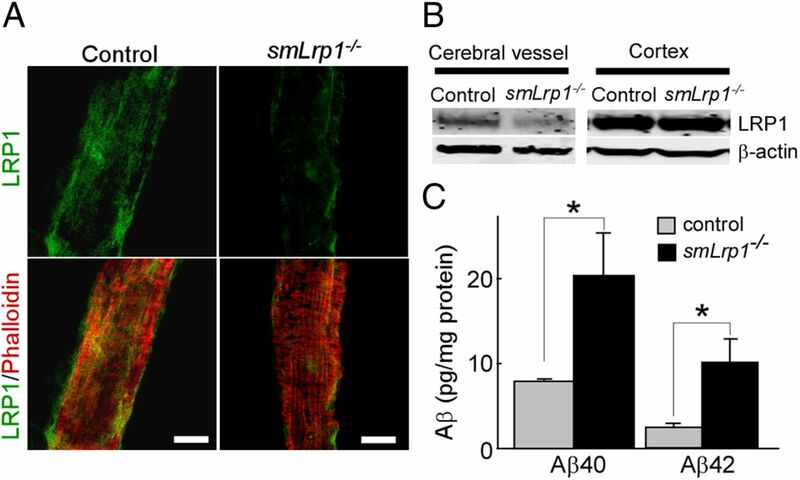 LRP1 deletion in vascular smooth muscle cells in APP/PS1 mice exacerbates astrogliosis. A, Astrogliosis in brain sections from control APP/PS1 and APP/PS1; smLrp1−/− mice (13–14 months of age) detected with a GFAP antibody. Scale bar, 50 μm. B, GFAP levels in the cortices of control APP/PS1 and APP/PS1; smLrp1−/− mice quantified by Western blotting at 13–14 months of age. The activation of astrocytes is enhanced in the cortex of APP/PS1; smLrp1−/− mice compared with control APP/PS1 mice. C, When GFAP levels in cortices of control and smLrp1−/− mice were analyzed at the age of 12 months, there was no significant difference between those mice. Data are plotted as mean ± SEM (n = 5). *p < 0.05. N.S., Not significant. Hydrogen peroxide downregulates LRP1 levels in HBVSMCs. LRP1 expression levels in HBVSMCs after incubation with increasing concentrations of hydrogen peroxide (H2O2) for 24 h and analyzed by Western blot. H2O2 significantly suppressed LRP1 levels in a concentration-dependent manner. Data are plotted as mean ± SD (n = 3). *p < 0.05; **p < 0.01.